The coming of the railways to Yeovil revolutionised the town’s transport and communication with the world beyond and changed forever its industry as new markets became viable. The Town Commissioners' Minutes of 11 February 1845 recorded "The Clerk laid before the meeting a notice he had received from the Bristol & Exeter Railway Company of their intended application to Parliament for a line from Durston to Yeovil which it was considered would cross some of the Roads belonging to the Trust but, on examining the Plan, this did not appear to be the case and the Clerk was directed to return an answer of 'neuter' to the application." In the Minutes for the meeting of 8 September 1846 it was recorded "It was resolved That in consequence of the probable increase of (the Watchmen's) Duties during the ensuing Winter, by reason of the number of Navigators (mainly Irish 'navvies') here, that they be increased to 12s a week till Lady Day next." In 1847 John Batten called a public meeting to discuss rival plans for bringing the railway to the town. The first line to reach Yeovil was the Bristol and Exeter Railway (B&ER), as a branch line from Taunton via Langport and Martock. It had a terminus at Hendford and Hendford Station, Yeovil’s first railway station, was opened in 1853. Daniel Vickery described this tumultuous event thus “On Saturday, October 1, 1853, the Yeovil Branch of the Bristol and Exeter Railway was opened with great ceremony. A procession was formed, consisting of the Yeovil Brass Band; the members of the Yeovil Guardian Friendly Society, with banners; Sergeant-at-mace, in full uniform; the Portreeve and Burgesses; and a numerous attendance of the authorities and the tradesmen of the town. The Chairman and Directors having arrived by train were received by Thomas Binford Esq., the Portreeve, who addressed them in the following words: "Gentlemen, I am happy to see you. I have no robe of office, neither have I a written address; but I have brought you that which is far better, thousands of warm hearts and happy faces." Mr Buller, the Chairman, responded to these few hearty words of welcome in corresponding terms and the Directors having joined the procession, all returned, in the order in which they came, to the Mermaid Inn. A dinner was provided by Mr Watts, at the Town Hall, which was presided over by the Portreeve. Several loyal and local toasts were given and responded to and the company did not retire (with the exception of the Directors, who were compelled to leave earlier) till a late hour. And so was inaugurated the Bristol and Exeter Railway to Yeovil. The Bristol & Exeter Railway (B&ER) was authorised by Act of Parliament in 1836 and employed Isambard Kingdom Brunel as its Engineer. The B&ER worked in collaboration with the Great Western Railway (GWR) building the London to Bristol line, with both railways using Brunel's broad gauge of 7ft 0¼in. The line reached Taunton in 1842 and was extended to Exeter in 1844. In 1845 the B&ER obtained an Act of Parliament for a branch line running from a junction with the B&ER at Durston, just outside Taunton, to Yeovil, terminating at Hendford. The Hendford terminus formed a broad Y-shape with its stem facing west, with a goods yard on the northern arm and a single platform passenger station on the southern arm. The Railway Hotel in Hendford, variously known as Reid's Hotel, the Hendford Hotel, the Railway Inn, Railway Tavern and the Railway Hotel, opened around 1858 to serve the travellers using the station. Meanwhile, the Mermaid Hotel and the Three Choughs Hotel both established horse-drawn omnibus services for their guests that met every train. At the same time as the Durston to Yeovil branch was being built, the Wilts, Somerset and Weymouth Railway (WS&WR) was constructing a line from Frome to Weymouth. The line was taken over by the GWR and, coming from Frome, reached Yeovil's Pen Mill Station in 1856. Consequently the B&ER continued their extension from the Hendford passenger station to Pen Mill. 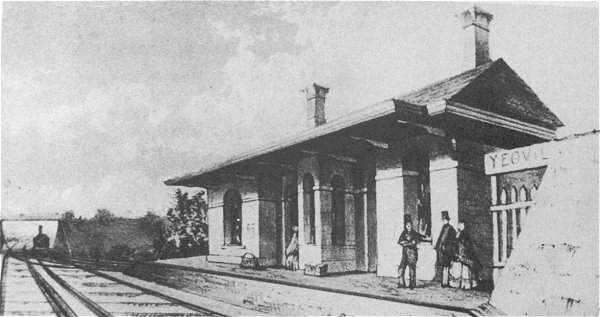 The extension opened on 2 February 1857, being the same day as the opening of the Frome to Yeovil line. Having been Yeovil's first railway station, Hendford was closed for passengers, having been open for just 3 years, 4 months and 1 day. However Hendford was kept as a "goods depôt", retaining the shed over one siding. Industrial businesses developed in the area around the Hendford railway goods station to such a degree that Hendford Halt was opened on 2 May 1932 for passengers. 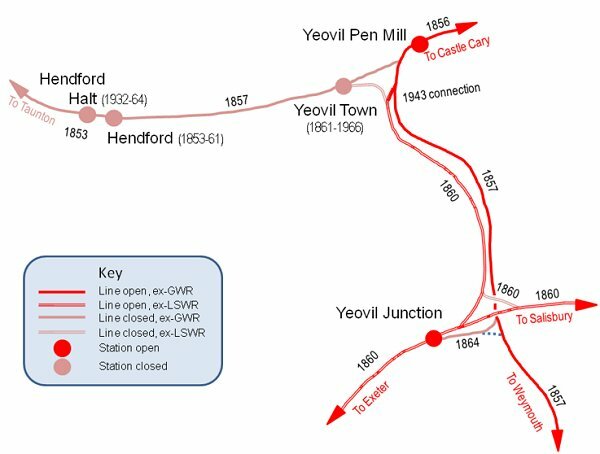 Sketch plan of Yeovil's somewhat complex railway network showing the relative locations of Yeovil Town, Pen Mill and Junction stations, Hendford terminus and Hendford Halt. Click on any station name to open its page. A sketch of the Hendford terminus, Yeovil's first railway station, shortly after its opening. It was to remain open to passengers for just 3 years, 4 months and 1 day. 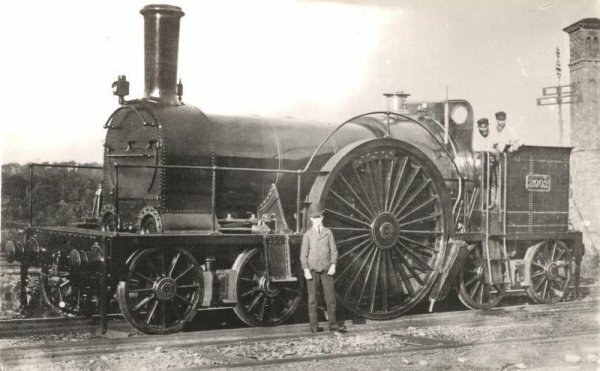 This is a Bristol and Exeter 4-2-4 locomotive of the type in use when Hendford opened in 1853. 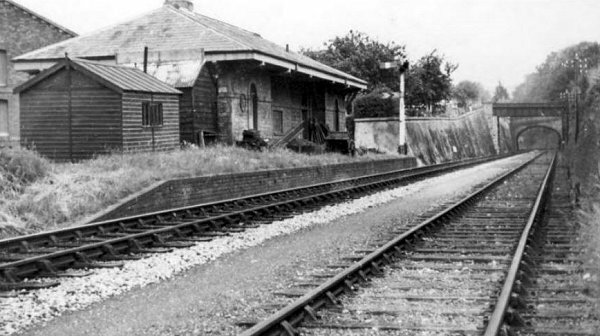 The original buildings of Hendford station, closed to passenger traffic in 1861. Photographed in 1953.